The Scorpion II TL-3 Trailer Attenuator from TrafFix Devices is the world's first MASH Tested, Passed, and Eligible Trailer Attenuator. 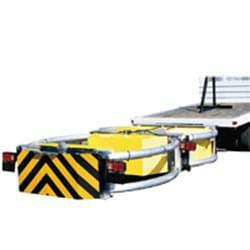 The Scorpion II Trailer Attenuator attaches to a truck and requires little to no modification of the host vehicle. The Scorpion TL-3 Trailer Attenuator attaches to a truck and requires little to no modification of the host vehicle. The Scorpion TA has been NCHRP-350 tested and accepted for all mandatory and optional offset and angled impacts on unrestrained host vehicles. 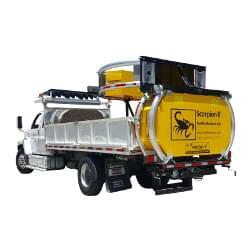 The Scorpion Truck Mounted Attenuator is hydraulically powered and is ideal for stationary and mobile construction zones. The Scorpion TMA has been tested and PASSED ALL optional and mandatory requirements suggested in the NCHRP-350 TL-3.